From the sailors of yesteryear to the hipsters of today, there have always been Oregonians who are inclined to “get inked.” The Oregon-centric IFC sketch comedy series Portlandia has gone so far as to declare this the place where “the tattoo ink never runs dry”–and even a brief stroll around Stumptown would probably convince any visitor that tattooing has never enjoyed greater popularity in the Beaver State than it does today. That impression is most likely correct, but Historic Oregon Newspapers confirms that our interest in tattoos goes back much further. 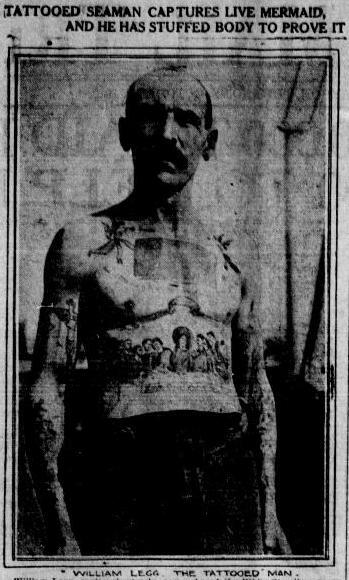 Tattooed sailor William Legg, from Medford Mail Tribune, October 3, 1912, p. 2. Note 'The Last Supper' on his stomach. 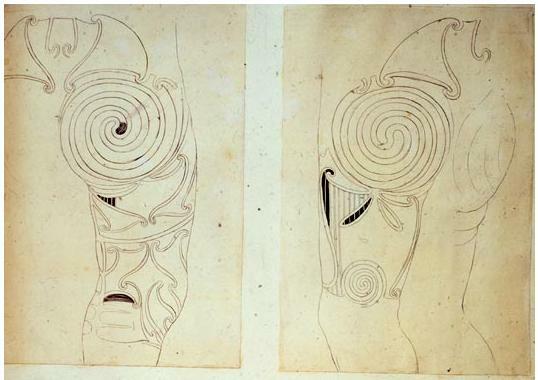 "Black stains upon the skin called tattow": Designs worn by indigenous people of New Zealand, sketched by Sydney Parkinson during Cook's voyage of 1769. Image courtesy of the British Library. One hundred years after Cook’s voyage, the South Seas Islanders’ traditional practice of tattooing remained an ethnographic curiosity, often remarked upon by observers from the West–as in ‘The Singular Samoans,’ a Salem Evening Capital Journal article dated March 11, 1889. However, even as the mainstream of Euro-American society continued to view tattoos as primitive, mysterious and even a little dangerous, certain Western subcultures were already beginning to adopt the practice by the latter half of the 1800’s. Primary among these were sailors and soldiers. Naturally, these professions were the ones that brought European men into contact with non-European cultures in those distant parts of the world–Africa, East Asia, Polynesia, etc.–where the tattooist’s art was still a living tradition. The first Western people to be tattooed in more than six centuries were inked by indigenous artists. Eventually, some of the soldiers and sailors learned the craft and brought it back to the ports of Europe and America. Tattoos are truly an antique commodity of global cultural exchange. The earliest story about tattoo art in a digitized Oregon newspaper is ‘An Admirer of Washington in Trouble,’ from the Jacksonville Oregon Sentinel of December 10, 1870. The story tells how a notorious Portland criminal named Shultz could most easily be identified by “the effigy of [George] Washington on horseback, tattooed upon his breast, in India ink… Doubtless Shultz now regrets this indiscretion into which he was lead in his youth.” Here we have probably the first Oregonian ever to rue an impulsive tattoo decision–a sentiment to which many contemporary Oregonians still can relate! 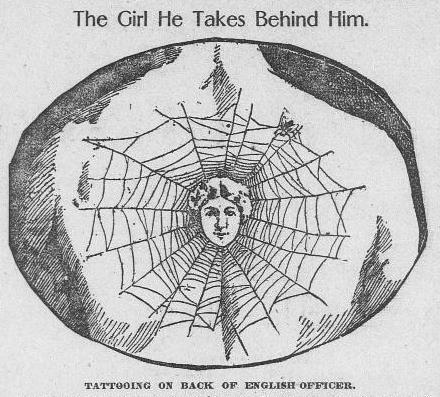 By the turn of the 20th century, the Portland Oregonian is reporting on “the tattooing craze which has overspread all England.” The issue of January 7th, 1900 recounts that the fad began among aristocratic young men serving in the Boer War, but now “[it] is growing and spreading among civilians.” The article specifically alludes to one tattooed guardsman “who bears a title known the world over.” This seems to be a coy way for the editors to demonstrate that the trend indeed has reached the highest levels of society, but without going so far as to name names of the participating rich and powerful. (They are quite possibly referring to Edward, Prince of Wales. See below.) Tattooing was, after all, still regarded by most readers as exotic and fairly scandalous business. Another Oregonian piece from later in the same year puts forth the then-novel notion that tattoos, at their best, might rise to the level of fine art. 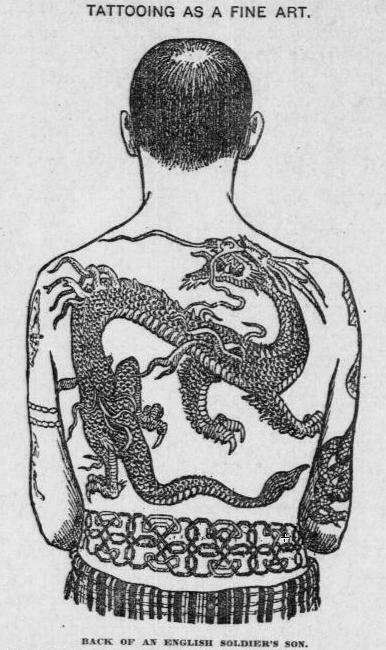 As the Evening Herald item pictured above indicates, tattoo art would continue to go in and out of style at various times throughout the 20th century. In 1922, even the ladies were getting in on the act, and more conservative-minded commentators were once again concerned that “it threatens to spread to America.” So the pattern was set: in the decades to follow, the tattoo “fad” would continue to wax and wane in popularity with the general public, right up to the latest revival that is still going strong today.